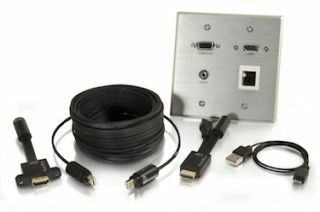 The What: C2G's RapidRun Optical is a modular solution that includes a variety of flying leads, runner cables, and wall plates which are the hallmarks of the RapidRun product line, providing all the cost and time savings of RapidRun with the high performance needed to carry today's UltraHD, 4k at 50/60 (2160p) HDMI signals up to 1,000 feet. The What Else: The solution now includes new DVI connections for healthcare applications with DisplayPort connections soon to come. The fiber-based features 18 Gbps bandwidth, a diameter of just a half inch, a 5mm bend radius and OFNP (plenum) rating, delivering sufficient bandwidth and flexibility for an easy install to serve the audio/video needs of commercial applications for years to come.